There's something about being on a road trip that makes me crave food I'd never consider at home. Sadly the burgers at Mrs Beesley's weren't quite as good as I had hoped, but I can still feel that sense of anticipation when I look at this picture of the freewayside storefront. TwoWishes Tara on September 27, 2012 at 9:46 p.m.
You have to love any place whose sign just says "EAT." Haven't been around for a while -- happy to be participating in Photo Friday once again! Sonja on September 27, 2012 at 10:30 p.m.
Too bad the burgers were disappointing - looking at the place it seems they'd be old-fashioned delicious! 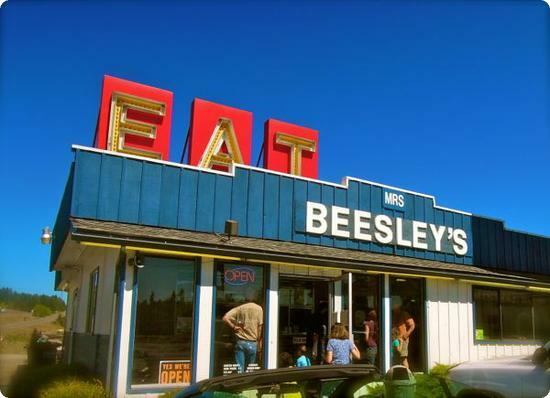 Global Travel Blog on September 28, 2012 at 3:23 a.m.
EAT at Mrs. Beesley's. The good thing is we don't have to bother preparing burgers like we do at home. Someone prepares it for us! Mara on September 28, 2012 at 4:01 a.m.
You never can tell what food at a restaurant like this will be like in my experience - we found a place in Missouri with a similar sign that had the best fried chicken and mashed potatoes I've ever had! Lisa on September 28, 2012 at 4:46 a.m.
We suspend any and all rules about eating when we are on a road trip - I would definitely stop at Mrs. Beesley's!! Jody on September 28, 2012 at 5 a.m.
eileen @ FamiliesGo! on September 28, 2012 at 7:34 a.m. I had the opposite exprience in Mystic recently. A $20 giftcard for the diner next door to our hotel came with the room. We went there for dinner because I was traveling by myself with the kiddo and it was just too easy, but I didn't have high hopes. And low and behold, it was really good. Food was fresh and well-seasoned (and with the giftcard, practically free!). Debbie on September 28, 2012 at 9:10 a.m. I just loved that EAT sign too! The freeway has changed so much that you really don't see it from the road the way people must have when it was built. We found Mrs Beesley's on Yelp! Kate @ Wild Tales of... on September 28, 2012 at 9:53 a.m.
Bummer that the burgers were not as good as you expected, but looks like a fun family travel memory nonetheless! Steve on September 28, 2012 at 10:03 a.m. I find it funny that the "Mrs." part of the sign seems like it's designed to be changed at will. Is it "Mr." Beesley's some days? Or does it change between "Mrs." and "Miss" like a Facebook relationship status? Of course if the burgers were good, I wouldn't care at all. Kirstie on September 28, 2012 at 10:09 a.m. When we're bike touring all we seem to do is EAT. But the great thing is we don't have to worry about the calories or eating too much, we just burn it all off. We so have to watch out when we take the car though! The sign's a great call to action! Tonya @ The Traveling Praters on September 28, 2012 at 1:35 p.m. It may not have met your expectations burger wise, but it looks interesting enough. Until recently, we pretty much stuck to chain restaurants when we traveled. We never take time out until we're all starving and cranky so we head to the closest fast food joint. They're always disappointing too. :( On our last trip we decided that we really need to try more local flavors and fun diners and dives. Good or bad, it has to be more memorable than McDonald's. Mike on September 30, 2012 at 7:55 a.m. The look of the Mrs. Beesley looks good. I am disappointed having known that burger is not good there! I still want to try it though. Terumi on October 1, 2012 at 6:37 a.m.
Family Holiday Guide on October 6, 2012 at 3:08 a.m. I don't like the burgers at Mrs. Beesley's because it is a bit uncooked and saggy. Despite this, I like other dishes on its menu.